Class at Sagawau – Let's Paint Nature! I’m currently studying to become a Master Naturalist in the state of Illinois, a class which takes us to various locations to study different subjects. Today we were at Sagawau Environmental Learning Center, studying ornithology. Oooo birds! This little male chickadee is being fitted with a tiny bright pink band. measurements are taken and recorded before banded and released. This female brown headed cowbird was not happy being handled by the instructor. 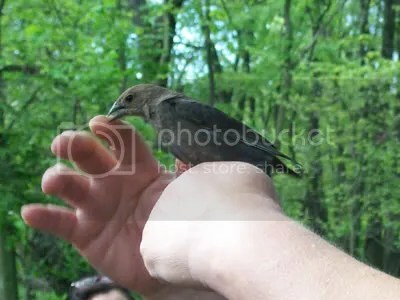 I was allowed to hold and release a male brown headed cowbird who also gave me a bite (OUCH) to remember before flying away. That’s okay, I consider it a love bite. Later in the afternoon, we went for a canyon hike. The canyon is not open to the public, however Sagawau does host many canyon hikes and you can sign up to go on a hike with an instructor. 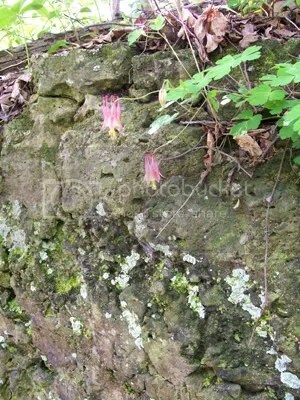 Look what grows in the canyon wall, columbine! I think this would make a wonderful painting along with the moss and lichen. Maybe this weekend we can do a canyon columbine painting. 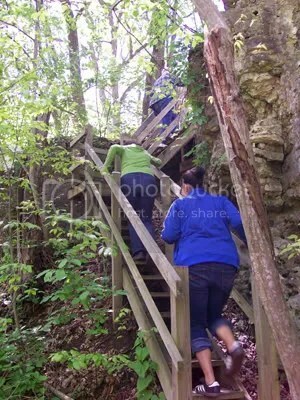 Climbing out of the canyon is not for the faint of heart; this very narrow one person-at-a-time stairwell is the way in and out. 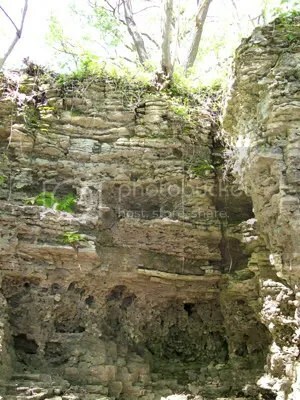 Did you ever guess that the Chicago area had a canyon!?! In the prairie state? Flat land for as far as the eye can see? Well, Sagawau is the only canyon in Cook County. If you are in the area and get a chance, sign up for a canyon hike, but be sure to bring your waterproof shoes for the canyon has an active stream. ← Let’s Paint a Hawk Feather! I’m totally envious of your classes…How cool! That columbine on the cliff would make a PRIMO painting, of course! Pingback: Some Paintings Don’t Make It « Let's Paint Nature!